POWELL PERALTA "DELICIOUS" SKATEBOARD T-SHIRT. GOOD CONDITION WITH A TINY HOLE ON ARM ( SEE PICTURES ). FOR DETAIL ITEM SEE MORE PIC. Vintage 1950s “Airman” Rayon Gaberdine jacket. Navy Blue. Size 38. Overall good condition.. does need to be cleaned, has some fading in areas and some small pin holes in areas and some split fabric along waist band. Still perfectly wearable. See photos for condition. Underarm to underarm- 21.5” Sleeves from shoulder- 23.5” Shoulders- 17” Shoulder to hem- 22” Feel free to contact me with questions.thanks! Hanes- 100% cotton. Vtg 80's T-shirt HAWAII '82 ! Destroyed Distressed thin soft holes- see pic. Blue with white screen print. Chest- 21" flat. Length- 25" flat. Shoulders- 19". One for the NIKE collector. Vintage Nike T-Shirt 1980s Original Made in USA "Very Good Condition" Faded ! Tag Blue Tag 50/50 Soft Thin,Single Stitch Size L Chest 20.5" Length 28"
(see photos). Shoulder Seam To Shoulder Seam: 15". Chest (Underarm to underarm lying flat) 17 3/4". Sleeves (Shoulder seam to cuff): 6 1/2". Length (Bottom of collar to hem): 24 1/2". (see Photos). IT'S A 50/50 BLEND, MADE IN THE USA, AND SINGLE STITCHED. Levis 506XX denim jacket type 1 made in Japan 1993. This is size 36. Has sign of wear around neck as shown as picture 11. ・Red line selvage. The item waiting you! 【Condition】. 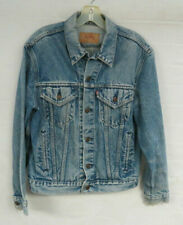 The item is Levis 557xx denim jacket type 3 555 Button 1998. Very dark indigo still left Nothing tear,hole and stain. The jacket is still fluffing as shown as picture 12. This is used item but still in exellentt condition. Very well made and great wear! Underarm to Underarm: 21". Sleeve Length: 22.5". Item will be tightly folded. Vintage 1950's Empire Bowling Shirt embroidered Sz M Wethersfield Ct. Shipped with USPS First Class Package. White is aged. No visible stains. Sorry about wri kles no iron handy. The item is 507xx(TypeⅡ) Size 38 made in Japan 1995. Has minor stain on right sleeve as shown as picture 11 and 12. No stain,tear and hole. Has sign of wear around neck as shown as picture 10. ・Red line selvage. 19" underarm to cuff. 23" length. What i want to show is Levis 557xx denim jacket type 3 Repro 1998. Very dark indigo still left Nothing tear,hole and stain. Around neck has sign of wear as shown as picture 11. This is used item but still in exellentt condition. Vintage 1950's Men's Knit Rockabilly Shirt Medium VLV. Shipped with USPS First Class Package (2 to 3 business days). This piece is an uncommon one and is in perfect condition. It is a knit, three button, pull-over with a cool panelled front. The main color is a medium dark blue. The sleeves can be rolled up to cuffs. The measurements are 40" pit to pit, 38" bottom when stretched, 24" shoulder to bottom, with a 24" sleeve. It is a larger medium size. There is a small size tag that is faded, but no other tags. It may be early 1960's. This men's top is certainly an eye-catching, Rockabilly piece that you don't see too often in any case! Please feel free to ask questions! What i want to show is Levis type-3 denim sherpa jacket 1980's. Size 42 made in USA. One of the shirts has a small dot stain near bottom hem that might wash out (see photos) and is sold as is. Chest: 38" (19" pit to pit). Materials: Cotton. Length: 28". By CARHARTT. Distressed Hooded. Pit to 27.5". Work Jacket. To Ensure Proper Fit. Shoulder to Shoulder→ 21.5". ITEM #6814. There are no notable flaws! , Looks new, I do not think it was ever washed !